On initial use or after a major (> 40%) water change, use 1 capful (5 mL) for every 40 L (10 US gallons). Thereafter use 1 capful for every 200 L (50 US gallons) daily or every other day. For smaller dosing please note that each cap thread is approximately 1 mL. I have a AP Bio-Chem Zorb pouch in my filtration system. Will it scavenge the organic component of Flourish Excel™? A: Chemical filtration medias will have a very minimal impact on Flourish Excel™ but not enough to warrant removing them from your filter when you dose this product. Is it better to add Flourish Excel™ at night or in the morning based upon plant carbon uptake physiology? A: Carbon intake is a function of photosynthesis. Based on this, it would be ideal to dose Flourish Excel™ during the day. But given that Flourish Excel™ can stay complexed as a carbon source for up to 24 hours before it dissipates, you can dose at any time of the day and the product will be available for the next 24 hours. Flourish Excel™ is not carbon dioxide and there is no impact on pH using it. Is Flourish Excel™ a replacement for CO2 in a planted aquarium? A: Yes and no. It provides the same benefit as CO2, i.e. it provides the plants with a source of carbon for growth just as CO2 provides them with carbon. However CO2 by itself will give you quantitatively more growth than Flourish Excel™ alone, although Flourish Excel™ does provide a substantial amount in comparison. If CO2 is a 10, Flourish Excel™ is a 6-7. Using both together provides additional benefit. One of the advantages of the Flourish Excel™ is no up front equipment costs and complexity of valves, hoses and regulators, etc. What effect would an airstone/agitation have on Excel's effective CO2 levels? A: An air stone or other surface agitation will not impact the effectiveness of Flourish Excel.™ Flourish Excel™ is not CO2, it is simply a readily available source of carbon. This is an intermediate source and more readily available than CO2 and will not interfere with the uptake of CO2 as a carbon source. Is Flourish Excel™ okay to use with Anacharis? A: Anacharis is a particularly sensitive species (known to be sensitive to high temperature, trace copper, formaldehyde etc.). 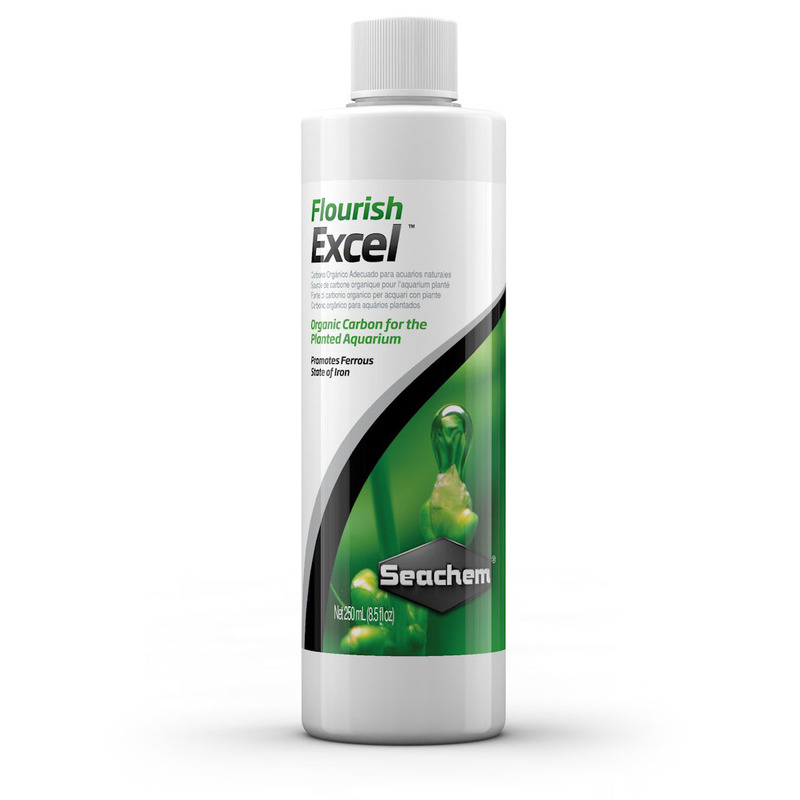 It is also sensitive to Flourish Excel.™ If you have Anacharis in an aquarium in which you are dosing Flourish Excel™ we recommend using it every other day rather than daily. Is Flourish Excel™ safe to use with marimo moss balls? A: One side effect of using Flourish Excel™ that hobbyists have reported is that certain types of algae growth tend to lessen when Flourish Excel™ is dosed in an aquarium. Black beard algae seems to be particularly affected. Marimo moss balls aren't actually moss, but are actually a type of algae. Because of this, many people have been concerned about using Flourish Excel™ with marimo balls, however, the majority of the feedback we have gotten is that Flourish Excel™ has no negative effect on marimo balls when used according to directions. Here is a link to a forum post where aquarists are discussing their experiences with Flourish Excel™ and marimo balls. Because some people have observed reduced algae when using Excel, some people try to use it to treat unwanted algae. We do not produce or market it as an algicide and using it as spot treatment where it is overdosed or applied directly to a plant can cause damage. With marimo balls or any sensitive plant you can begin with a small dose and increase slowly over time after observing for any negative reaction. If the moss balls are the only plants or the tank is sparsely populated, reduce the dose accordingly as they are low-light, slow growing plants and will not use as much carbon as other faster growing plants. Will the Flourish Excel™ kill the Vallisneria or will they adapt over time as some people suggested? We had received reports from several hobbyists who said that they had seen Vallisneria melt when Flourish Excel™ was used with them. We also had reports of them thriving with Excel. Because of this, we decided to do an experiment to test this in our lab. First we did a preliminary study with several val species (Amazon val, Italian val, corkscrew val, contortion val) with three tanks with different dosages: double dose, recommended dose, and a control with no Excel. In that initial experiment, we did see some melting of leaves in the tank receiving the double dose, though the damage wasn't extreme and new leaves grew in strongly to replace the lost vegetation. In the regularly dosed tank, we didn't see any issues. This was a short term experiment just to see if we could see an effect and based on the results, we launched a more carefully controlled experiment where we tried to more carefully determine the best guidelines for using Flourish Excel™ with Vals. 1. Large doses of Flourish Excel™ can sometimes cause some melting of the leaves of Vallisneria. The larger the dose, the more likely there might be an issue. 2. The damage is temporary; the roots aren't affected and it grows back strongly and tolerates future dosing of Flourish Excel™ even at higher than recommended doses. 3. Vallisneria normally tolerate the regular maintenance dose with no problem. In both experiments they weren’t affected by the daily dose, only higher doses. 4. When other nutrients (nitrogen, phosphorus, iron, potassium) are dosed, Flourish Excel™ doses could be much higher without melting any leaves of the Vallisneria. Is Flourish Excel™ safe for fish? A: Yes, when used as directed, Flourish Excel™ is completely safe for fish. CAUTION: Do not eat drink or get into eyes. In case of eye exposure, promptly & thoroughly wash eyes with water & seek medical attention.